It is 2 Days before Christmas Eve and I am still making Christmas Gifts. I could have made these last summer, but of course that would have made my life too easy this week. I dried these ferns that I gathered from my garden and because of that, I thought my Mom, daughter and 2 Granddaughters would enjoy them. I stamped the verse from 2 Corinthians 9:15. Thanks be unto God for His unspeakable gift. As I was stamping so many things came to my mind of which I am thankful; My wonderful husband, my daughter and her entire family, Jon's daughters and their families, my Mom, my brother and his family, my good friends, my health, our home and material blessings and most of all my heavenly Father who promises us eternal life. I just touched the surface of things, but I think you get the idea. I am very thankful for all of God's blessings. Merry Christmas everyone and thanks for stopping by this busy time of year. I so appreciate it! 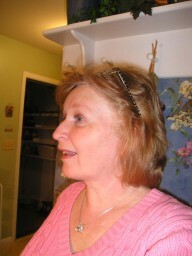 Merry Christmas and a very Happy New Year to you Joan. What a beautiful framed gift you've created! I just love it and so will the recipient, for sure! Joan, what a worthy verse to use in this way and a lovely way to present it. 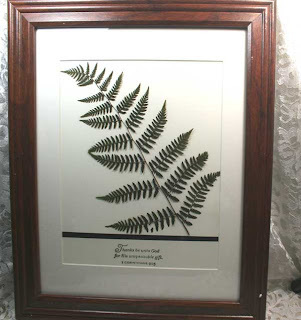 What a great gift idea and perfect Bible quote to go with the lovely pressed fern! Merry Christmas and a Beautiful New Year to you Joan. I know your family will love this heartfelt gift. What a great gift! It is very thoughtful and something they will remember you for. Your mentoring and your love. A very beautiful gift, and so very thoughtful Joan. Merry Christmas to you and yours, I wish you all God's blessings throughout the coming year!